Everyone has their own requirements when looking for the best gaming mouse. Some people simply want the best wired gaming mouse or the best wireless one, while others might prefer to prioritise the shape, size and weight of the mouse over everything else, especially if they’re left-handed. To help you make the right choice, I’ve gathered together all my best gaming mouse picks below, catering for right and left-handed peeps alike across a range of prices. Whether you’re looking for something small and light and or big and bulky, there’s a best gaming mouse recommendation for you. Every gaming mouse on this list has been tried and tested right here in the RPS Treehouse, too, so you can be sure you’re looking at the very best gaming mice available today. For those after a great gaming mouse that doesn’t break the bank and offers loads of extra features, it simply doesn’t get much better than the Corsair Ironclaw RGB. Not only is its large, contoured shape super comfortable to use over periods of time, but its weight of 105g and responsive sensor make it lovely and fast in the hand, too. Sure, the dash of RGB lighting won’t be for everyone (although you can always turn it off using Corsair’s easy-to-use iCUE software), but it’s a lot better-looking than the hard, ‘gamery’ edges and matt / gloss combo design of the similarly-priced Logitech G502 Hero (and regular G502, by extension – which I also quite liked, for the record). The Ironclaw RGB also offers more functionality than the mildly cheaper and equally unassuming Steelseries Rival 310, which currently goes for £45 / $46. The Rival 310 is still a great choice for those looking to keep costs down (as is the identical Sensei 310 if you’re looking for a cheap ambidextrous mouse), but the Ironclaw does a lot more with that additional tenner, such as giving you an extra DPI or sensitivity profile to play with, a braided USB cable, seven programmable buttons instead of six, and the ability to turn one of those buttons into a ‘sniper’ button for on-the-fly DPI adjustments to give you better control when lining up shots in FPS games. All in all, it’s a great value gaming mouse, and our top choice for those in need of a new clicking machine. 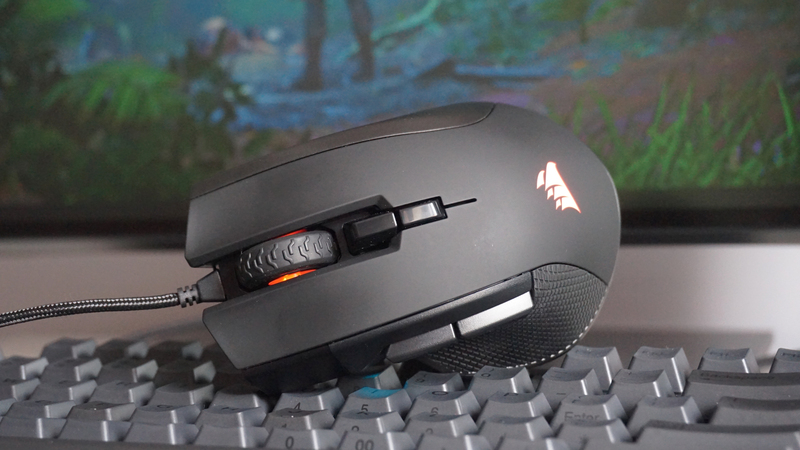 For more info, read our Corsair Ironclaw RGB review. If the Corsair Ironclaw RGB is too far out of your price range, then the half as expensive Steelseries Rival 110 gets a lot right. It’s quite small, which is perfect for my spindly fingers, but it’s also exceedingly light, making it feel lovely and smooth to move round your mouse mat. I don’t have anything against larger mice, but they can be more of a chore to move quickly. The main left and right clicks are also rated for 30 million clicks over the course of the Rival 110’s lifetime, which is a rarity at this end of the price spectrum where you often get no guarantee whatsoever, and you get two extra side-buttons on the left hand side of the mouse, which can be configured to all sorts of different functions. These include keyboard buttons, macros and media controls, as well as a bunch of Steelseries Engine apps for competitive games such as CS:GO and Dota 2 – a nice extra if you happen to be a fan of those particular games. The only downside to the Rival 110 is that its central DPI button only lets you switch between two different sensitivity speeds. More expensive mice often offer as many as four or five, but at least here you have the option of setting them yourself. Other mice at this end of the price spectrum (such as the HyperX Pulsefire FPS) often aren’t so generous, making you put up with fixed presets with no way customisation. You also get all the acceleration and deceleration options you’d normally expect to see on more expensive mice, making the Steelseries Rival 110 great value for money. 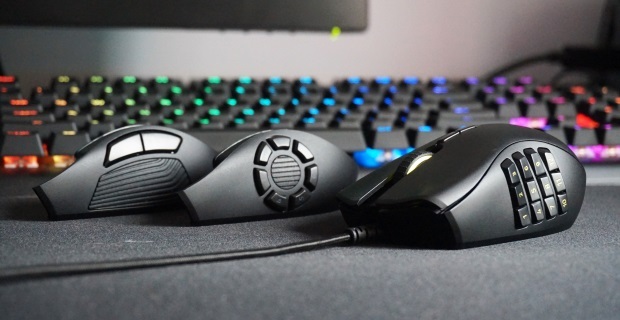 For more info, read our Steelseries Rival 110 review. Personally, I don’t think I’d ever spend close to £100 on a gaming mouse, but for those after true high-end perfection, the Razer Naga Trinity makes a pretty compelling case for itself. Essentially three mice in one, the Naga Trinity’s party trick is its interchangeable side panel, giving you up to 19 different buttons to play with depending on your play style. The basic side panel gives you a standard two extra buttons, while the second and third start piling them on like nobody’s business, giving up to 19 in total. These will no doubt come in handy if you’re a keen MMO or MOBA person who likes having dozens of macro commands at your disposal, but even if you’re not there are plenty of other things you could use them for as well, such as every media control under the sun, or a barrage of keyboard shortcuts. You also get a choice of five DPI profiles on its central button beneath the scroll wheel, but this can easily be remapped to another one that’s easier to reach if you download Razer’s Synapse software. I particularly like that you have the option of being able to change your DPI on the fly, too, allowing you to get back to the action sooner without the faff of having to press another button. Instead, you can simply hold one down to slow things down, and then let go again when you want to return to normal speed. There are, admittedly, plenty of cheaper mice that have dedicated ‘sniper’ buttons for this sort of thing, such as the Asus ROG Gladius II and the Logitech G502, but at least here you have the option to assigning this function to any button you like. For more info, read our Razer Naga Trinity review. This entry was so very nearly the Steelseries Sensei 310, but the equally excellent Asus ROG Pugio has come down a lot in price recently, putting it neck-and-neck with its ambidextrous Steelseries rival. The Pugio does a lot to earn its keep, too. Not only is it a very comfortable mouse to use on a day-to-day basis, regardless of whether you’re actually left-handed or not, but it also comes with loads of extra goodies in the box, including two replaceable Omron switches (just in case the 50 million click-rated ones it comes with happen to wear out), and a pair of side button covers. The Pugio is another relatively small mouse, standing just 37mm tall, but it does mean it’s a heck of a lot easier to reach its side buttons. Its central DPI button once again only lets you swap between two different DPI profiles, but Asus’ Armoury software lets you pick anywhere from a deadly slow 50 DPI all the way up to 7200. You can also adjust them in increments of 50 as well – most mice make you settle for chunks of 100, but the Pugio gives you just that extra bit of fine-tuning. The Pugio does have a fair amount of LED lighting to contend with, admittedly, but at least you can use Armoury to turn it off altogether if it proves too distracting. Those with multiple Asus ROG components in their PC may want to leave it on, however, as its Aura Sync support means you can have them all flashing the same multi-coloured light show in unison. For more info, read our Asus ROG Pugio review. The Logitech G Pro Wireless is hands down the best gaming mouse I’ve ever used, wireless or otherwise. It’s expensive, yes, but wireless gaming mice often are, and this really is the absolute cream of the crop. It’s wonderfully agile and super comfy to use, and weighs an almost impossibly light 80g. That’s practically unheard of in wireless gaming mouse circles, and when you combine that featherlight nothingness with Logitech’s super fast Lightspeed wireless tech and its brilliant Hero 16K sensor, the Pro Wireless definitely feels like £130 / $150 worth of gaming mouse. It may not have a central DPI button like every other gaming mouse on the planet (it’s actually on the bottom of the mouse, for some incomprehensible reason), but Logitech’s intuitive Gaming Software tool gives you plenty of flexibility when it comes to customising its various buttons to suit your gaming habits. Whether you’re right or left-handed, you’ve got loads of options here, including being able to change your DPI or sensitivity setting on the fly for as long as you hold down your chosen button. 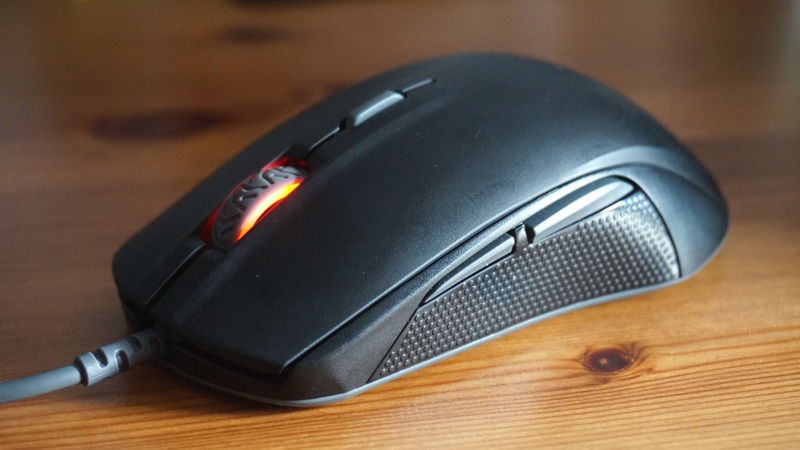 The Pro Wireless is also one of the most tasteful gaming mice I’ve ever seen. Its smooth, simple curves are accented by a single zone of RGB lighting over its G logo on the rear of the mouse, and that’s it. Not jaunty angles, no glossy flourishes; just good old-fashioned design that doesn’t make you want to blush with embarrassment every time another human being claps eyes on it. If you’re after the pinnacle of gaming mouse perfection, then look no further than the Logitech G Pro Wireless. 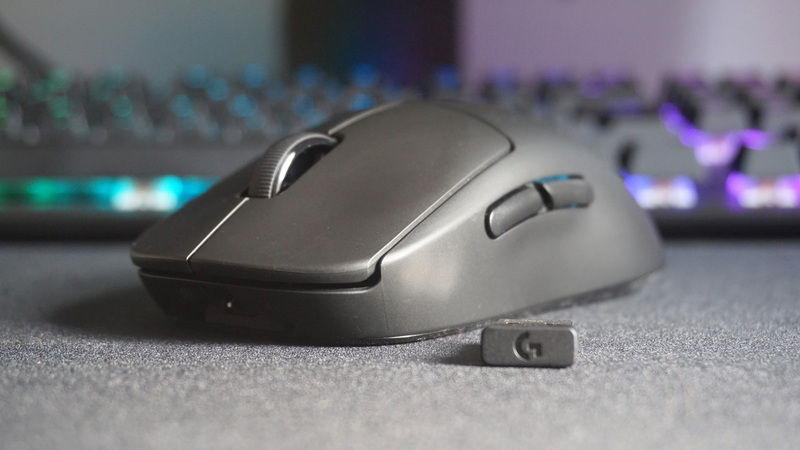 For more info, read our Logitech G Pro Wireless review. What makes a good gaming mouse? For me, comfort is high on the list, but flexibility is another key consideration, whether that’s a wide sensitivity / DPI (dots per inch) range or multiple, configurable buttons. That said, sometimes less is more. Just because a mouse has a DPI range up in the 10,000s doesn’t mean it’s necessarily better than one with a maximum of 7200 (generally, anything above 3000 DPI is so blisteringly quick you’d need bionic eyes to keep track of it). The same goes for buttons. Instead, it’s all about how you can make the most of what the mouse has to offer. I’m also not too worried about what type of sensor a mouse has either. Some may be able to tell the difference between one kind of sensor and another, such as how much lift-off one has as well as the kind of acceleration and deceleration speeds you can expect when you put the mouse back down again, but for me they’re all much of a muchness. I’ve never encountered one that felt horrible to use or felt less responsive than another, and for general gaming purposes I’d say they’re all of an equally high standard. As such, my best gaming mouse picks focus less on the sensor and more on what you can actually do with them. And if you’re also looking to pair your new gaming mouse with a nice, new gaming keyboard, then check out our best gaming keyboard rankings for the best membrane and mechanical keyboards available right now. Tagged with Asus, Corsair, feature, Hardware, Logitech, mice, mouse, Razer, steelseries.